A group of soldiers were standing in the blistering sun facing due west. Their sergeant shouted at them: Right turn! About turn! Left turn! In which direction are they now facing? East. A right turn is 90 degrees, an about turn is 180 degrees, and a left turn is also 90 degrees. Therefore, the soldiers are now facing east. 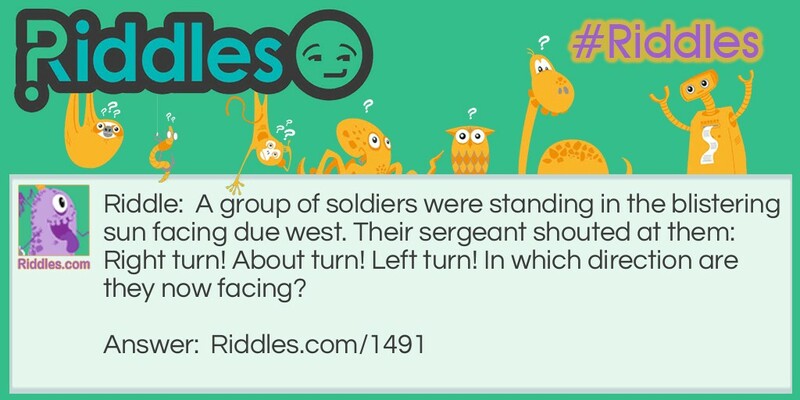 A Group of Soldiers Riddle Meme with riddle and answer page link.